← It’s Not All Sweetness And Light. … in Tech, designing and creating, pinning and stitching and generally behaving yourself – well, what sort of reward could you expect? To start with there are these carefully chosen, colour co-ordinated bundles of fabric which you might be offered if you work hard. You could take the bundle of your choice and use it in all sorts of projects, make extra things with it or just keep it in your bag, bringing it out occasionally to touch it and admire it because don’t we all do that? (These are actually just my fabric scraps, folded and tied with cotton tape. It’s all in the way you sell it. The kids think I cut the pieces especially.) 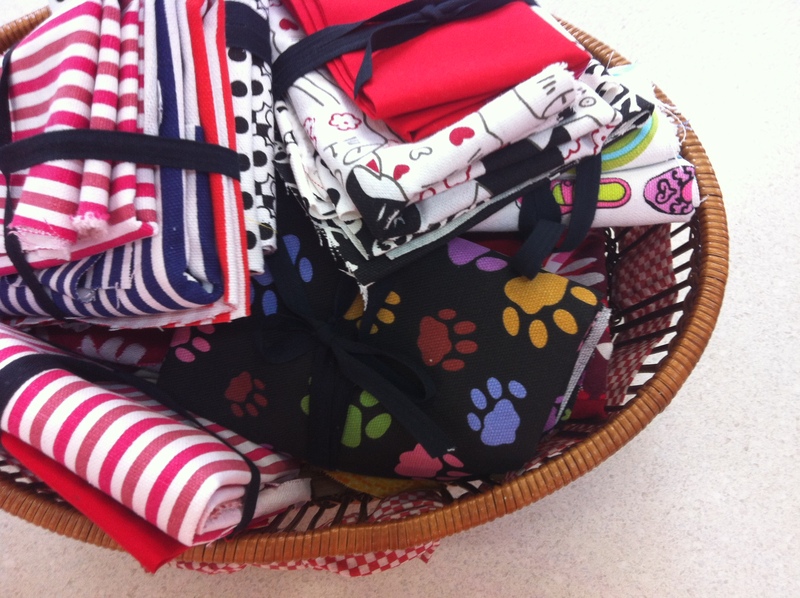 The paw print fabric, being the very end of the last roll, is highly covetable. 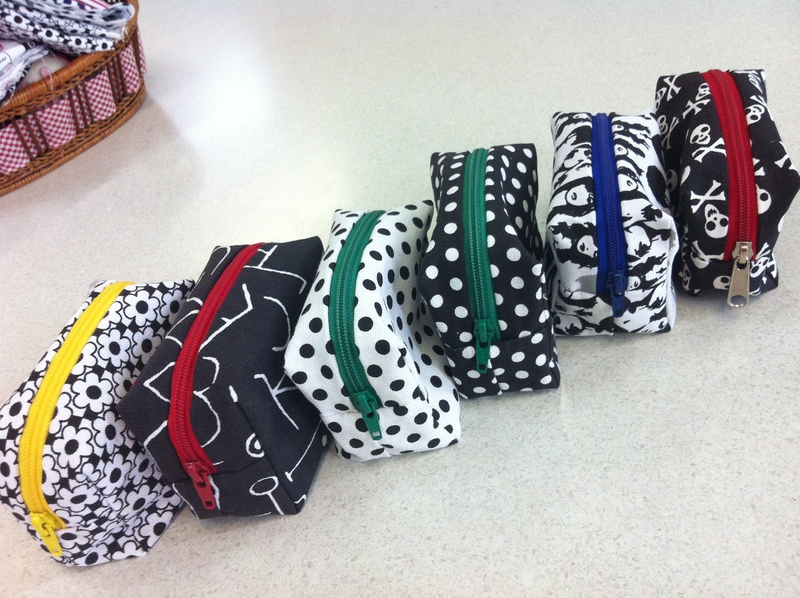 And then there are these intriguing little pouches lined up on the table. I make them from cotton canvas following this brilliant and much-loved pattern. A bright zip to add some color. You have to do something pretty amazing to earn one of these. 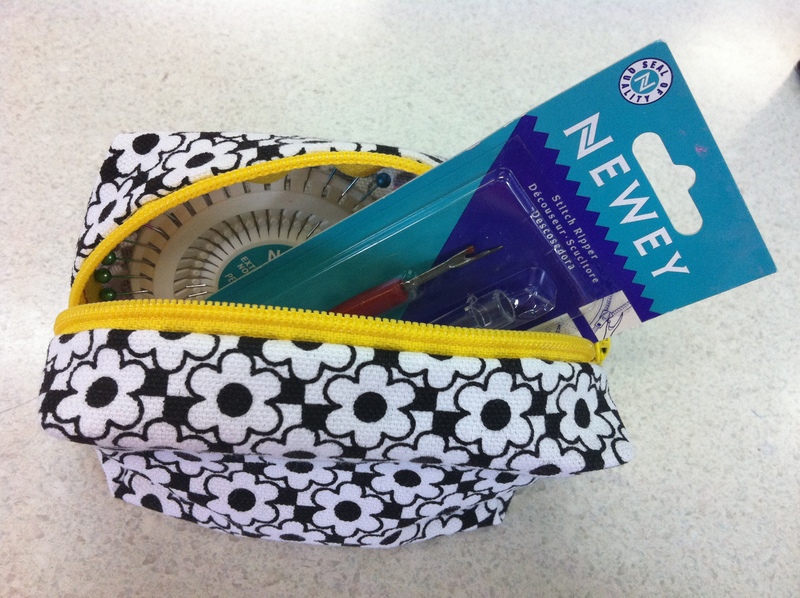 It’s cool enough that you get your own pouch to stash your hacky sacks or lip glosses or your badge collection in. But if you zip them open, you’ll find there’s already treasure inside. Pins and needles, a tiny pincushion, some fabric chalk, a tape measure and the all-important seam ripper. Kindly sponsored by a very generous friend up north who knows what it takes to keep kids interested and sent me the loot for these goody bags. You’ll be pleased to know that the take-up of these little sewing kits is as high for boys as it is for girls – hence the pirates and the tribal squiggles. So much better than lollies. Fab way of using that stash!!! I would have loved being in your class. Aw thanks… There are some kids who don’t see it that way and who spent a bit of lunchtime yesterday chasing Henry around school and shouting mean stuff about me at him. Poor boy. The perils of being a teacher’s kid. Funny, I was talking with a school mum yesterday and she said I’ll bet you could do with an extra pair if hands in here and I said I’ll pay you in bags! Parent help drops off majorly at Intermediate, I’d never thought about help in my room before now. You could just come and sew for fun! In my next life I want to come back as one of your students. You are just the coolest sewing teacher there ever was. Thanks Jenny, I feel a bit up and down about it at the moment. Gotta focus on the smiley ones and not the ones who let me know on Thursday that I’m the ‘gayist teacher eva’. Haha, brilliant. Will remember that for next time.